About a month ago my church asked me if I would be willing to donate a painting for their auction/ fundraiser on Tuesday July 13th. So I decided to donate my next painting. 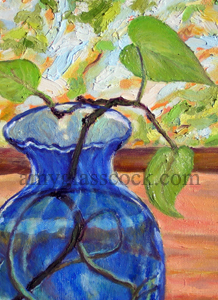 My idea for this painting came from this blue glass vase that sits in the window of my studio. 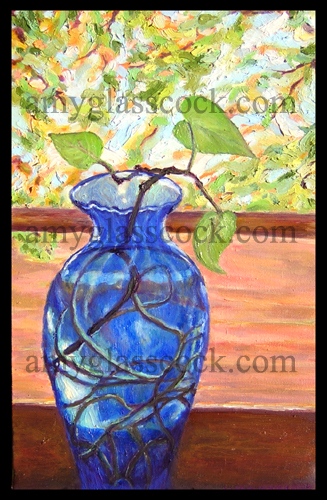 I often look at it while I am in there painting and I am drawn to the way that the light from the window moves through the blue glass and reflects off of the ivy plant's roots. I also like how the lines of the roots curve as they spread throughout the vase. Anyway, as you can see it doesn't take much to inspire me to paint. Congrats to Miss Sarah Wells, the newest owner of an Amy Glasscock original painting! Also check out this painting while it was in progress.